When I Had a Seahorse | Some parenting moments stick in your mind like play-dough in carpet. Some parenting moments stick in your mind like play-dough in carpet. This week, I popped to the shops with my three-and-a-half year old to find a birthday present for a tricky-to-buy-for friend. When I say “popped”, please don’t imagine a brief and cheery little outing, because that’s not at all what this was. Rather, picture the way a buoyant balloon is transformed into a wretched scrap when stabbed with a sharp object. That rapidly deteriorating state of being aptly describes my psyche after popping to the shops with my preschooler. I’ve broken the experience down for you into seven stages. I open the car door after our seven minute drive, and Elijah springs forth like a spirited racehorse; pawing the parking lot with scuffed sneakers, twisting and tugging away from me in an effort to go it alone. Why walk when you can run? “Meet you at the other end, Mummy!” he hollers as he charges down the mall, pedestrians hurriedly scooting out of his way. I catch him, entreat him to slow down, attempt to pin him to me. Our first stop is one of those exquisite gift shops made of feathers and light that I adore visiting without children. It’s the kind of shop that’s full of candles derived from exotic substances and trendy fruit no one eats, like Blood Orange and Tahitian Overwater Bungalow or Pomegranate and Leafy Sea Dragon Vapour. The high ratio of glass to non-breakable materials is terrifying. My son wants to walk, I insist on carrying him. His fingers seek out all the pretty, glittering things. My heart is in my mouth. Shop assistants smile benignly as if we’re all having a very pleasant time. Meanwhile, I feel as if I’m walking a tightrope with a slippery, flapping fish in my arms. There is a good chance that this store holds the perfect gift for a classy girl, but to be honest it feels far too risky to get within reach of any of the treasures. Next up, and thankfully with less stuff to break, is Country Road. I waste no time plonking Elijah in a stylish bucket chair and handing him my phone while I rummage through the scarves and jewellery. As every parent knows, devices are a blessing and a curse. A couple of uninterrupted minutes is helpful, but fails to produce the perfect gift. I’m ready to move on, but my son is still very committed his game of EarthMovers. I peel him from the chair and placate him with promises of Subway cookies. We’ve refuelled and refocused. I’m so ready to complete this simple mission and go home. Elijah is still full of beans; legs pumping down the sidewalk, trying to squirm out of my hand, rushing to press the buttons at the pedestrian crossings. And then he stops, so suddenly that a gentleman behind us narrowly avoids a collision. I tug his hand, but for a little guy he’s remarkably unmovable. It’s as if his feet have been set in concrete. Then the wailing starts, “I’m so, so tired! I can’t walk for one more day! Carry me! CARRY ME!”. I carry him to the bookshop, feeling acutely every one of his 15 kilograms. So we go. Back along the street. More button pressing at the pedestrian crossing. Into the shopping centre (“Hang on! Hang on! We’re almost there!”). Down a long hallway. Posh shopping centres have posh toilets. There’s a parent room with one of those frosted glass doors that look like they’re going to be see-through, and that slowly glide open when you push the right button. They always make me slightly nervous – what ever happened to good old reliable latches on toilet doors? Elijah tells me that he loves this toilet. There’s a little play centre next to the door, which keeps him occupied when it’s my turn to go. Suddenly I hear Elijah say, “Sorry! Sorry!” and realise that the door is sliding open before I’m done. Next I’m shrieking at my son and trying to get myself in order. There are people outside the door; I’m pummeling the button and the door is lazily sliding across, so painfully, desperately slowly that I have time to apologise and explain to a lady and her child outside the door that we’re not actually finished, my son just opened the door on me. I drag my son to the gorgeous homewares store, Wheel and Barrow. I know that this is my very last shot at getting a present. We’re both at our wit’s end. Elijah is writhing on the floor between black marble cheese platters and cocktail glasses, claiming to be a dangerous lizard. I pick something for my friend – who knows what. I hope she likes it. It was paid for with a lake of tears. Motherhood is glory and grief and adoration almost beyond what you can handle at times. Motherhood is listening to your 3-year-old wail on the toilet like his heart is broken because he just really wanted Mummy not Daddy to wipe his bottom. Do you ever think back on how you imagined life to look once you had kids? It’s not something I do often; the messy, loud and lovely tangle of real life has a way of pushing those hazy, long-ago hopes and dreams into the back corners of my mind. But something I am sure of is that there was always going to be a lot more catching tadpoles in jam-jars, reading books on blankets in the backyard, flying kites on blustery beaches and floating paper boats in puddles. In short, I always imagined there would be more life of the adventurous, memory-making kind. What I never envisioned (because you don’t, do you?) was this much laundry, this much television, this much time spent in supermarkets, this much fighting with my kids over packing up Lego. Yes, occasionally there are sandcastles, cubbies and creeks, but in reality so much more of life with kids is mundane and humdrum. That’s okay. I accept that a sizeable chunk of life for most of us is routine rather than spectacular. I also know that it’s possible to find sweet moments with my kids in the midst of the banal: a “ballet” routine by my preschooler while I’m washing the dishes, a love note slipped next to the pancakes by my six-year-old, hearing the two of them in the next room hooting with laughter over bad Knock Knock jokes. 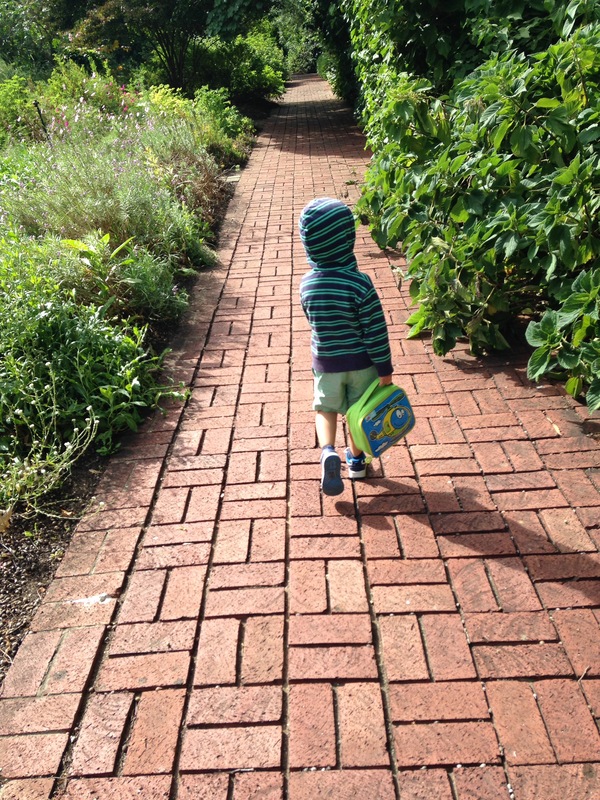 Even still, I’m aware – achingly so – that next year my youngest starts kindergarten, and there will be far less opportunities to just hang out with him. I want to make this short time count. 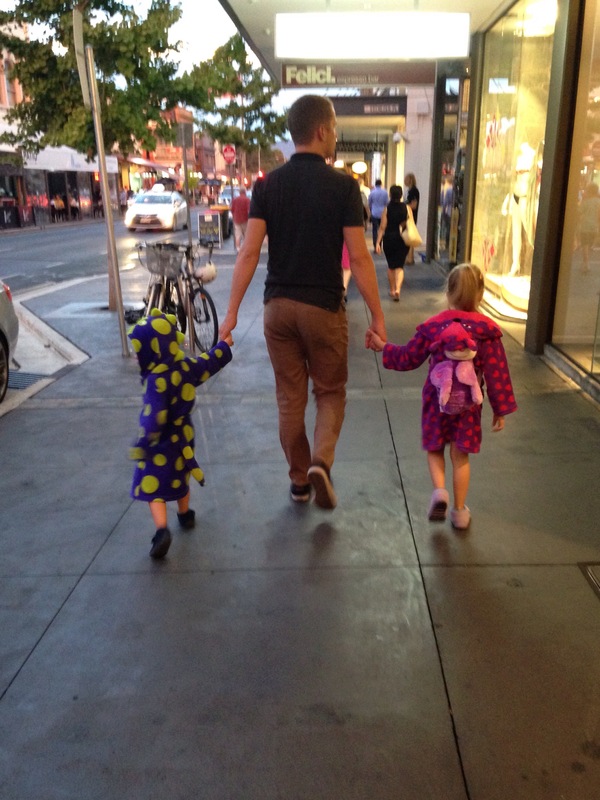 My husband is much better than me at adventuring with the kids. As he’s a pastor and works a lot on weekends, he gets a day off during the week. He uses this day to look after our three-and-a-half year old while I work. When I arrive home from school on Tuesday afternoons, the two boys regale me with tales of their adventures, which usually involve a journey somewhere via public transport, and have at times included a building site, a baby octopus in a shell, dolphins, a ball pit and a dragon boat race. My husband doesn’t overthink things, he just does them. 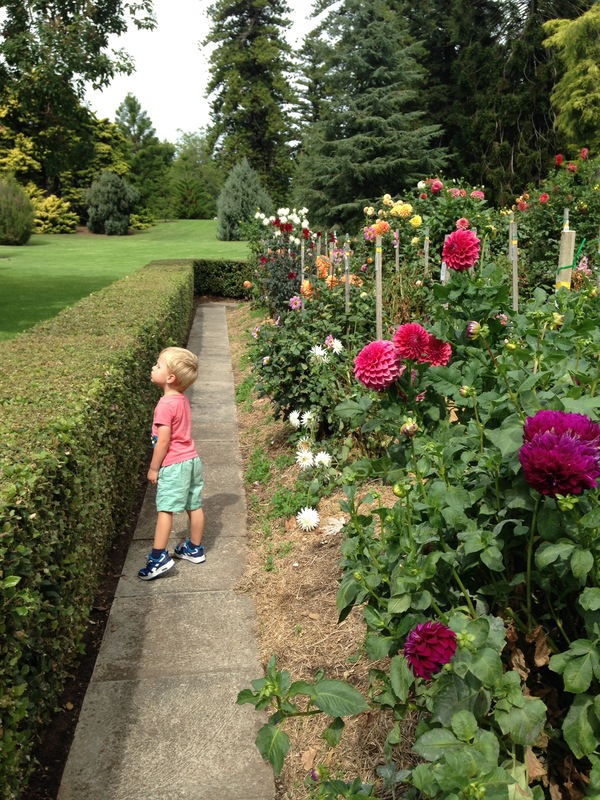 I admire the way he manages to squeeze every potential adventure out of the day – whether it be catching the O-Bahn bus to the bookshop with Elijah, or taking the kids to a new playground after picking Lily up from school. There were plenty of things I could have “got done” on Friday, but it occurred to me that none of those things were overwhelmingly pressing, and that all of them were completely forgettable. So in the spirit of prioritising adventures over laundry, Elijah and I packed the helicopter lunchbox and went in search of ducks and fish with whiskers. 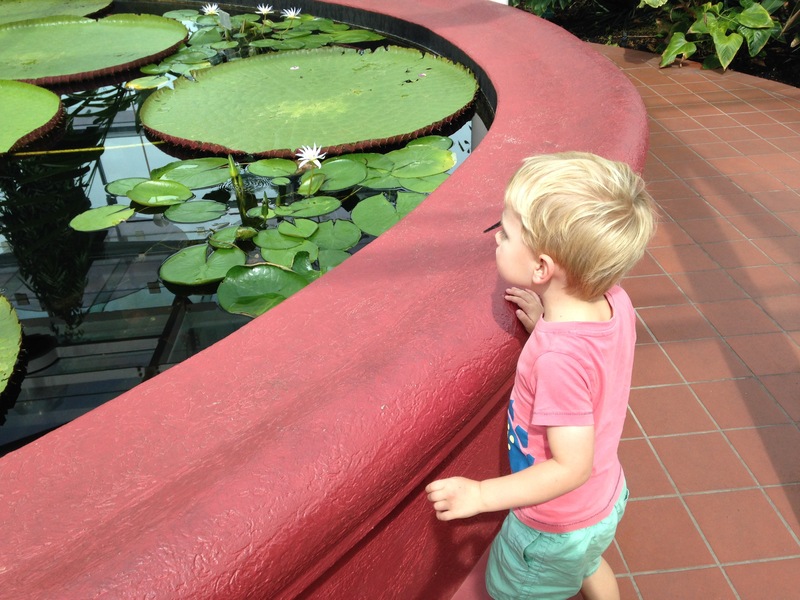 The Adelaide Botanic Gardens is one of my favourite places to visit – I love that once inside I instantly feel calm and hidden and far away, even though I’m actually only minutes from the city. The garden has added significance for my family, as my grandfather was the director for many years, and my dad grew up with it as his backyard. I let Elijah pick the path, and followed him as he ran past towering clumps of bamboo and low hanging bell-shaped flowers, over lumpy roots that nudged up the paving and beneath leafy canopies that blocked out the light. The world with all its rules about where you can and can’t run and climb and yell and throw is not always an easy place for a little boy who recently asked to change his name to Aeroplane. Giving him the freedom to lead the way – to run when he wanted and dawdle when he preferred – was such a refreshing joy for both of us. People talk about an unexpectedly breathtaking experience as a Wow Moment; according to the ever-reliable Urban Dictionary, it is “an introspective moment when you realise how freaking great your life really is.” One of the reasons that I enjoy outings with my three-and-a-half year old is that it’s not unusual for the whole trip to be a string of Wow Moments for him (in that regard, he’s pretty much the polar opposite of your typical teenager). Putting money in the parking meter: Wow Moment. Realising that the car is parked next to a toilet block: Wow Moment. 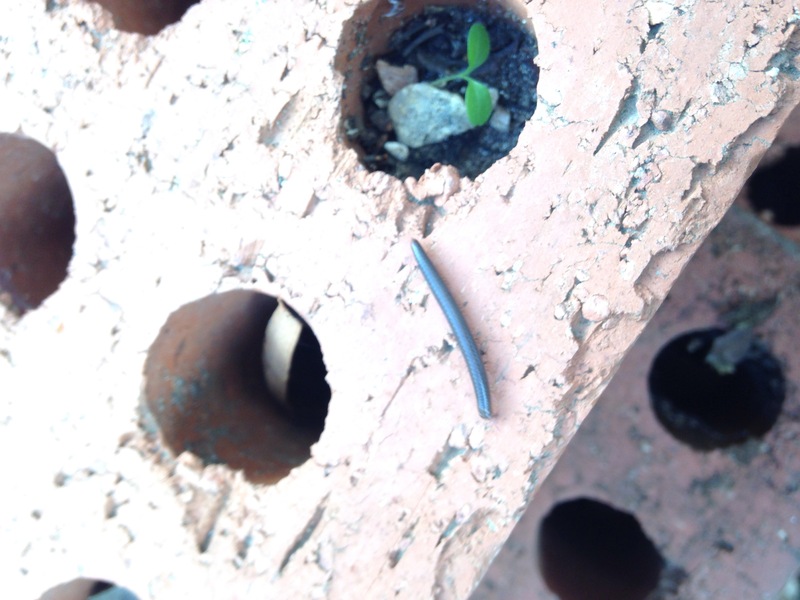 Walking over a bridge, rubbing your half-eaten banana on Mummy’s leg, finding a feather that looks a bit like a caterpillar: all Wow Moments. I find it near impossible to be bored and cynical in the face of his sense of wonder. We found our way to the immense conservatory. Standing with Elijah inside the vast, eerily empty jungle I had the sudden spine-tingling sensation that a T-Rex was about to crash through the towering palms. The spell was soon broken by a noisy primary school class. I couldn’t help but smile at the two boys racing ahead across the bridge despite the teacher’s protests – I was happy to be off-duty. Next we visited the lake and threw bread to a pack of belligerent ducks. The creepy whiskered carp appeared to have been cleaned out of the water since our last visit, but five hungry turtles, shells big as dinner plates, poked their wrinkled necks and bald old-man heads out of the water in search of treats. 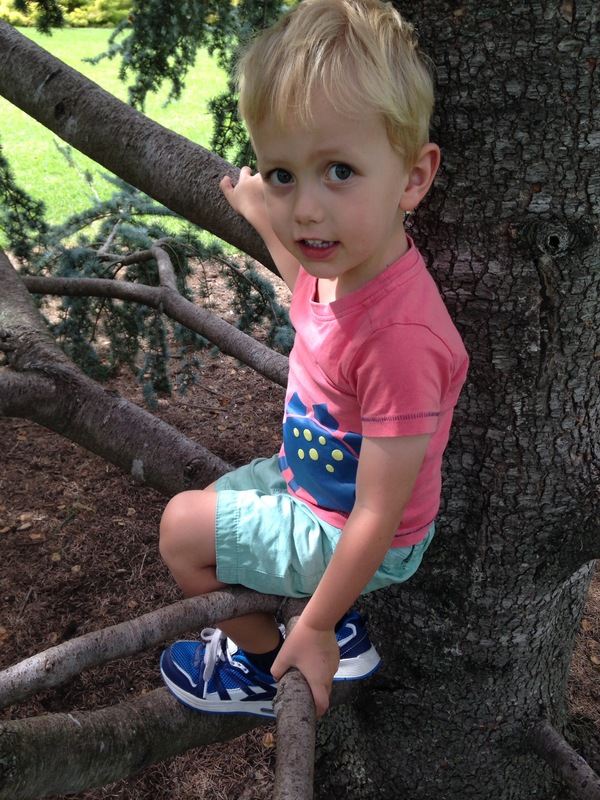 Elijah selected a patch of lush grass in the shade of a giant pine tree for our picnic lunch. We sat on our rug, snuggling, giggling, munching our sandwiches, and pondering the diet of lizards. We made a video with my phone of a banana aeroplane, which Elijah thought was the funniest and best thing ever (#Wow Moment!). 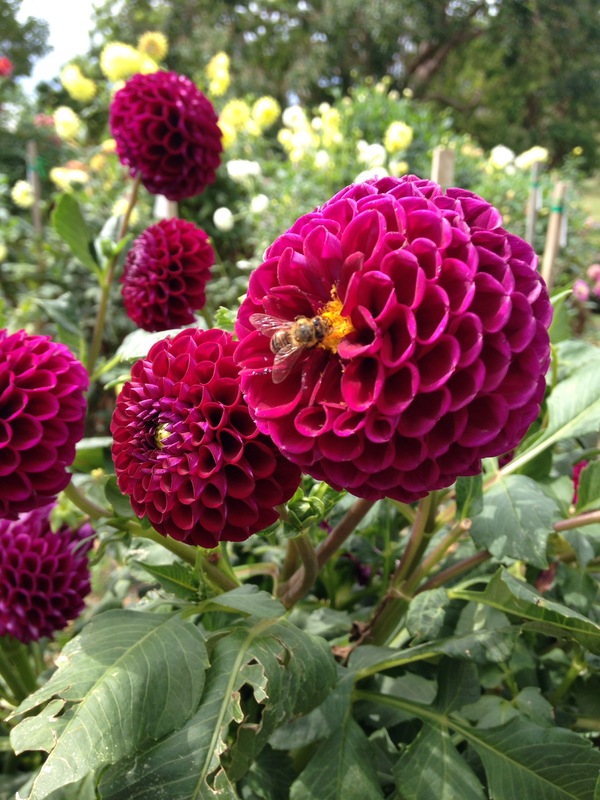 After lunch we explored the vivid dahlia garden, climbed a tree, played shops with leaves and seed pods and examined tiny fish and enormous Amazon Waterlily pads in their special glass pavilion. It was a good day. The thing that I’ve realised about adventures with little kids is that they don’t need to be grand or epic – at least not from an adult perspective – they just require you to step outside your routine for a couple of hours. The most successful adventures often seem to be the ones where the agenda is flexible, and where I allow myself to become lost in small details along with my child: a plane that drags a thread of vapour across the sky; a crocodile-shaped cloud; a bug – always a bug – with a shiny shell; a funny-shaped stick. The best adventures are also the ones where I find myself lost in the small details that make my child who he is: his purposeful walk along the path, green lunchbox in hand; the undisguised wonder and delight in his voice at each new discovery; the way he actually stops moving long enough for me slip my arm around him on the picnic rug; the gleeful laugh that bursts out when he knows he’s being cheeky. 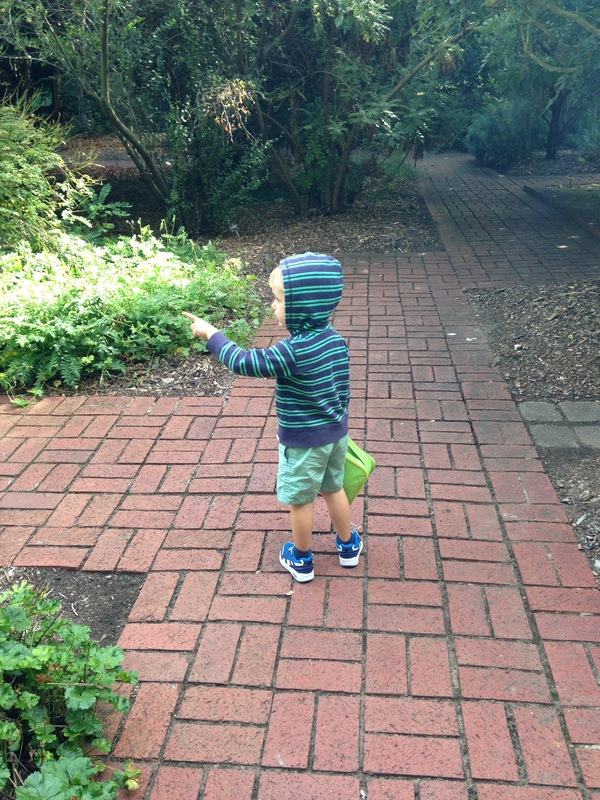 Last week in the garden, I had my own introspective moment when I realised how freaking great my kid really is. Oh he can be stubborn and impulsive and throw killer tantrums, but one-on-one, I honestly couldn’t think of better company to adventure with. Wow Moment. Once I looked forward and tried to imagine life with kids, and one day I know that I’ll look back on my reality of life with kids. Maybe I’ll remember that at times parenting small children felt like a never-ending slog, but I hope that’s not the overriding memory. I have about nine months until Elijah starts kindergarten. Nine months in which I get to spend more time with him, and possibly have more influence on the way he sees the world than anyone else. It would be all too easy to let this time slip through my fingers without a lot of conscious thought – between work and church commitments, Kindergym, swimming lessons, housework and homework, days pass quickly. But among all the voices competing for my attention, one voice that I don’t want to overlook is the one pondering the question of whether or not lizards eat bees. This year I want to choose more adventures. In the hour between dinner and bedtime, my kids gained and lost a new pet. They found her hiding amongst the Lego; her glossy black body contrasting with the bright blocks. I was washing dishes in the kitchen, and popped my head in to investigate the enthusiastic giggling and cooing that was coming from the next room. You know when your child proudly shows you an unruly scribble and tells you it is a mermaid playing with a dolphin in the stormy sea, and you make impressed noises so as not to hurt their feelings? I felt a bit like that upon being introduced to the new pet; truthfully I was less than delighted to even have her (apparently she was a girl) in the house, but I agreed she was very sweet because I love my children. The kids named their pet “Tricky” in recognition of her agility. They were thrilled with the way she climbed in and out of their Lego houses. 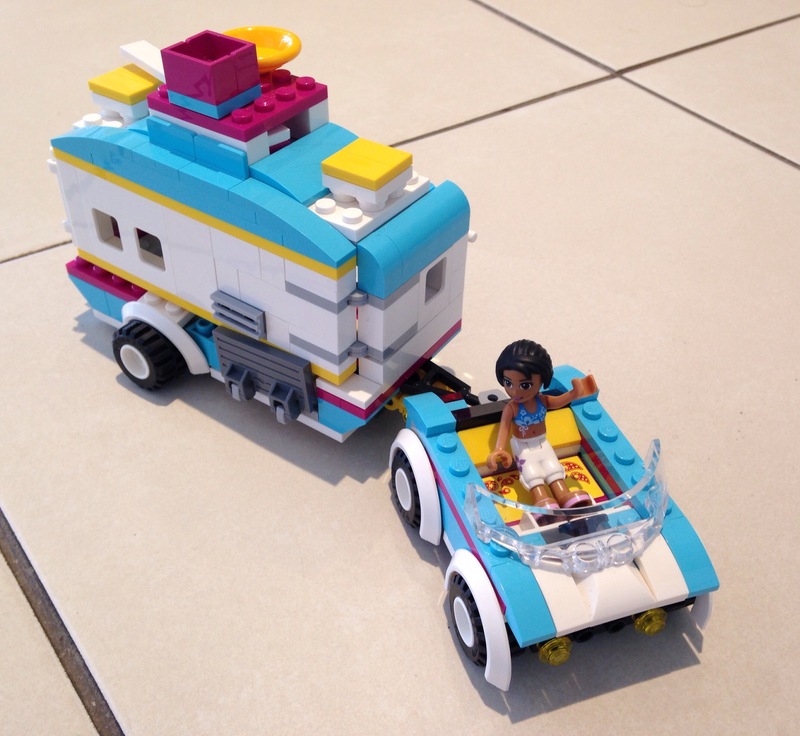 They paraded her around the kitchen in Lily’s Lego caravan, singing, “We’re going on a holiday!” at the top of their voices. They constructed a maze for her from cushions and toys, although she didn’t really grasp the concept of walking through it – repeatedly electing to turn back around the way she had come. They put her in with the little living bean sprout Lily had brought home from school. When I suggested that there was a strong possibility Tricky may decide to eat it, she screamed at Elijah to, “Take her out! Take her out!” That was when I realised that my daughter’s devotion to to her pet did not extend to actually touching her, and that beyond all the enthusiasm about Tricky’s cuteness, Lily was quite squeamish. “It’s very, very sad!” Elijah cheerfully agreed. They recovered pretty quickly – I suspect they had seen it coming. 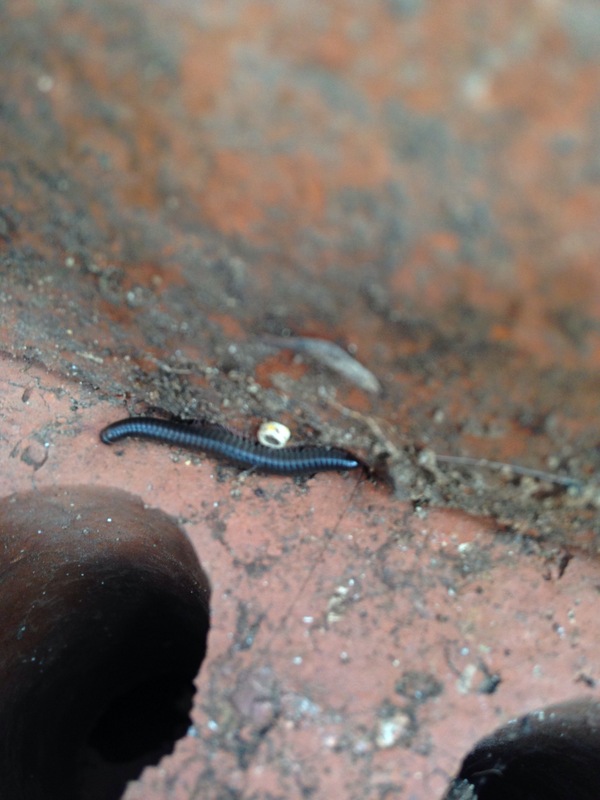 Three days later, my kids were playing on the opposite side of the garden, when they unearthed a whole family of potential pets. And there amongst that adorable wiggling pile – oh joy – they identified a familiar beloved form: Tricky! What a happy reunion it was, to see the dear one safe and well. Thankfully my kids seemed to accept that Tricky was now comfortably settled in her outside home. They brought her a scrap of felt for a blanket, a shell for a bed, and left her there in the bosom of her new family. It didn’t start until an hour past their bedtime, and it meant not getting home until 10pm. It was a school night. The parking was going to be difficult. It was starting to rain. There were so many reasons not to put our pyjama-clad six- and three-year-olds into the car and head into the city last Wednesday night, but still we went. 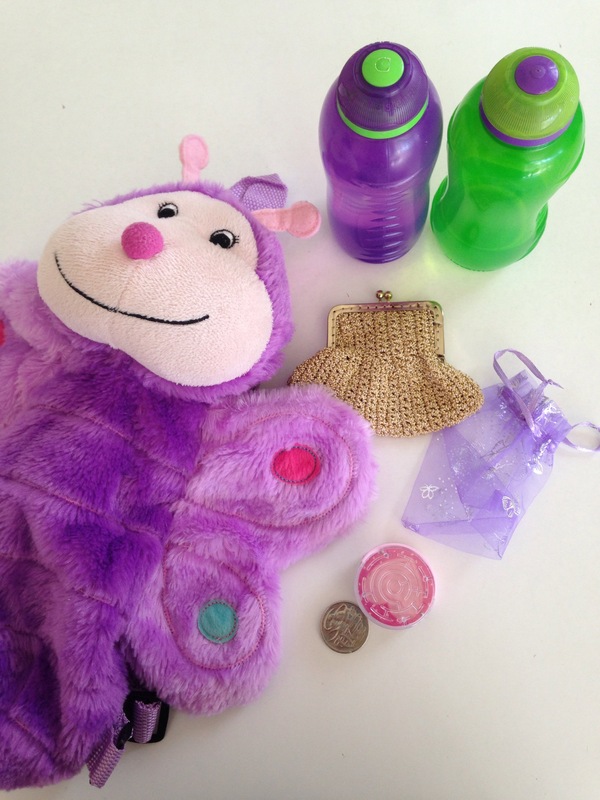 Lily packed everything we might need in her fluffy butterfly backpack: drink bottles, a small organza gift bag, a gold purse that belonged to my nana, a twenty cent coin and a slightly broken maze puzzle. On the drive in, we watched the dark clouds bloom brightly around the slowly falling sun. My normally quiet city had come alive for the Fringe and Festival. The East End was humming: antenna-wearing pub crawlers, sleek prowling lads, tipsy hens in shrill pink dresses, elderly couples conspiring together, carnies in striped suits lugging odd paraphernalia, and a pair of kids in slippers and hooded dressing gowns. The city at night is an adventure. Small fingers stroked the fuzzy artificial grass on a restaurant wall and attempted to lift shiny coins embedded in the sidewalk. Wide eyes took in quirky shop displays, gleaming motorbikes, a circus tent across the road, the smallest car ever seen. We sat at a table outside, enjoying the mild night, eating chocolate ice cream and watching the world go by. When the rain started again, we moved inside and sank into a big orange couch to finish our treats. The kids were buzzing with sugar and life. The shower passed, and we started walking towards the car. “Not back to the car yet!” begged Lily. 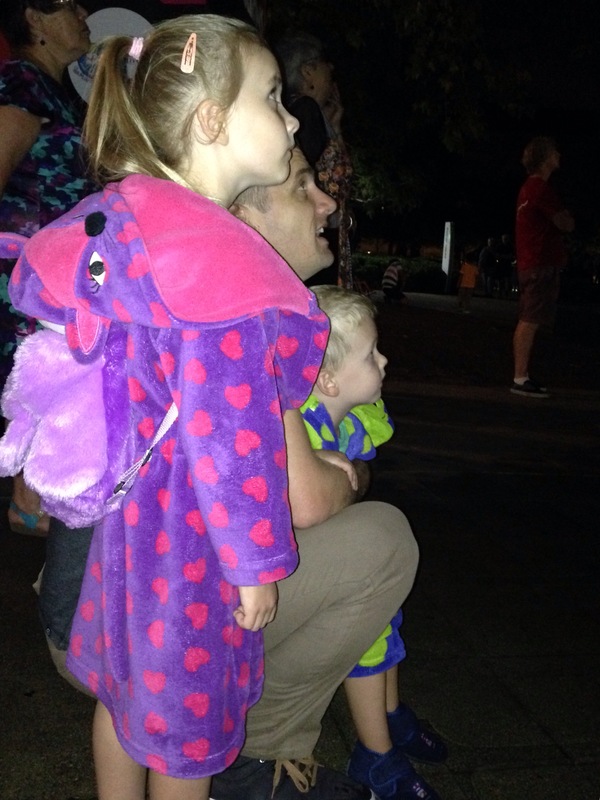 We reached our carpark and kept going; it was not bedtime yet. 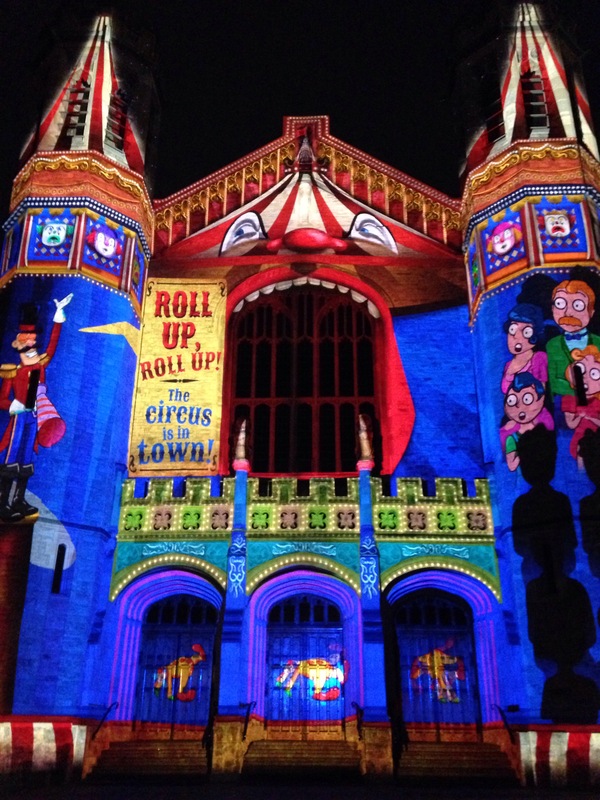 All along North Terrace, the usually sombre and stately old buildings had come alive with dazzling displays of projected lights and images. The kids watched enchanted as fish swam across the Art Gallery, Dreaming stories decorated the Museum and one of the university buildings was transformed into a circus tent. Then there was a street performer making bubbles from smoke and rainbows, a white puffball of a dog, a bagpiper playing Amazing Grace. There were steps to leap from and water features to examine. It was a lot to take in. When we finally got back to the car, Lily asked for a story about when I was a little girl for the drive home. I’m sometimes disappointed by the meagre handful of childhood memories I’ve brought with me through to adulthood. There are pieces of memory, of course, sensations and scenes, but not many complete stories that unravel neatly from beginning to end. I told Lily that she needed to make some memories herself to tell a little girl or boy of her own one day. I don’t understand the science of memory; the system through which some memories are filed and some discarded seems a little strange and random. Sometimes I wonder which experiences will become locked in as my kids’ first memories. I hope an event such as this night in the city might make the grade, rather than me telling them I can’t play now as I have to hang out washing. Perhaps it won’t settle in their brains as a complete narrative, but maybe as a few bright images, or even just as an imprint that our family does spontaneous things and has adventures together. Maybe they won’t remember a thing about the night. That’s ok too. All I know is that sometimes you have forget all the possible repercussions of a late night adventure, and just go. Valentine’s Day: I really wasn’t feeling it this year. It’s not that Jeremy and I usually go all out for the day; we prefer to make a bigger deal of our anniversary which is the month before. But feeling decidedly less lovely and loving on the international day of romance than on any normal day was unexpected and a little disappointing. We had been to a wedding the night before which was the epitome of romance: heart-felt vows, a radiant bride, fairy lights twinkling across an outdoor dance floor, and a groom who serenaded his bride with Bryan Adams, “Everything I do” (my 15-year-old self would have died to witness that!). It was a beautiful night, but I was a bit shocked at just how shattered I felt on the 14th. I’m not used to going to bed after midnight any more, and Lily and Elijah aren’t used to having sleepovers. I was tired, head-achy and irritable; the kids seemed to be intent on punishing us for having fun without them the night before (though I’m willing to concede that might have been all in my head!). From the time we picked them up at 8.30am, Valentine’s Day was unique only in that it seemed to have an excessive number of hours needing to be filled. We went straight to church, and before the service started my three-year-old sneakily helped himself to extra jelly beans from the service desk, then worked through his sugar rush up and down the aisles. In the supermarket trolley my kids were all pokes and prods and “he dropped bread on my foot” / “she looked at me meanly.” At the bakery Elijah leaned out of the trolley and forcefully poked a bag of finger buns, which earned us a killer look from the bakery lady and a mortifying lecture about how she could no longer sell them (and a free bag of finger buns, but that is definitely not the lesson here…). The rest of the day was more of the same – capped off with Jeremy having to go back to work, leaving me utterly wrung-out and without back-up for the evening routines. 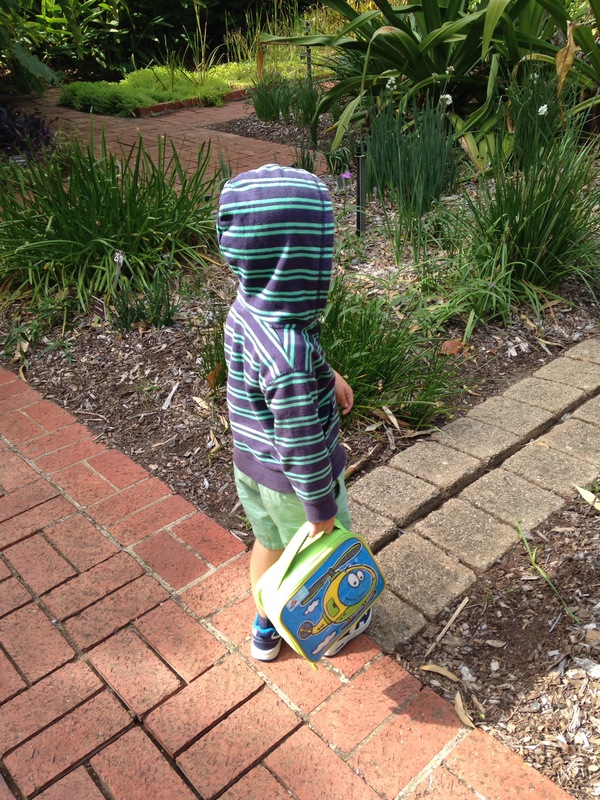 I wonder if all mums, even the really good ones, have off-days? As in dismally miserable I’m-about-to-lose-it off-days. Days where the bunch of stuff you always do for your kids (and even enjoy doing) seems suddenly completely insurmountable. Are there really any mothers out there who consistently manage to sail serenely above supermarket melt-downs, obstinate pre-schoolers and personal fatigue? Do they maintain voices soft as lambskins as they encourage their children to finish fruit snacks that have been styled to resemble the Very Hungry Caterpillar? Or could it be that those mums whose wisdom and serenity I admire just know when to let go; when to acknowledge that they need the sustaining power of One beyond themselves? Time and again, I doggedly slog on in my own strength, rather than surrender my burdens to Him who actually offers, “rest for your souls”. Mama, let’s talk about what we did today! Mama, I’m imagining what it would look like in a dinosaur’s mouth. Do you love me bigger than space? Yes, I love you bigger than space. Woah! Do you love me bigger than the sky and all the planets even the dangerous ones? Mama do doctor-planes have propellors? Imagine if our airport just had little planes! Do some of the doctor-planes pick up the sick animals? My arm rests on his pillow, his hand in mine. His cheek is pressed against my wrist and I feel his eyelashes brush my skin as he blinks slower and slower. And there, right at the end of an average day, was my love story. Because what more could you ask for on Valentine’s Day, than someone whom (despite his maddening tendency to eat the jelly beans and poke the finger buns) you love bigger than all the planets, and who you know without question loves you in return? Be mine, little man of my heart. In the lead-up to Mother’s Day, I found myself both transfixed and irritated by a particular advertisement on Facebook. It wasn’t obscene or crude or exploitative, it was just, well… a bit ridiculous. Clad in a gold negligee with glossy blonde curls cascading over her slender shoulders, the “mother” rises like a mermaid from a pastel sea of roses, pastries, handbags and parcels piled across the bed. A glittery pink eye mask is pushed up her porcelain forehead, and gosh she looks well-rested.